1) Blueberry Cream Cheese Mousse – Satu’li Canteen – Directly across from Pongu Pongu is another quick service restaurant in Pandora – The World of Avatar that is set up more like a traditional restaurant. The Satu’li Canteen is open daily for lunch and dinner and is industrially themed as it was formerly used as a mess hall for the RDA. Guests who dine at the location can enjoy the residual industrial architecture and details in addition to Na’vi artwork and cultural items. The menu items at the Satu’li Canteen have a decidedly healthy outlook and include options such as a Chopped Wood-Grilled Chicken Bowl, Sustainable Fish Bowl, Vegetable Steamed Curry Pods – Bao Buns, and Cheeseburger Steamed Pods – Ba Buns. While the delicious main course options are amazing, guests should definitely save room for a delicious treat that keeps the healthy theme continuing by combining several fruits. 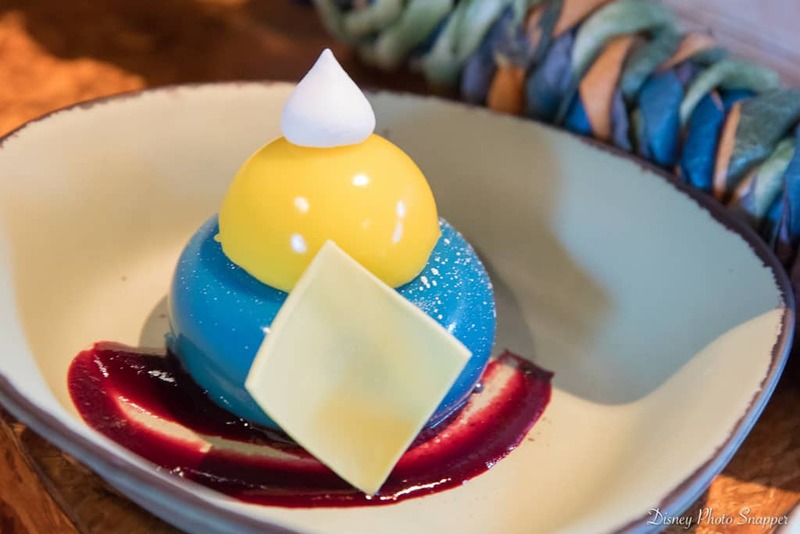 The Blueberry Cream Cheese Mousse features a rich and creamy blueberry mousse paired with tart and sweet passion fruit curd making it a unique and absolutely amazing dessert to enjoy in Disney’s Animal Kingdom!